What Causes Overspray With a Paint Spray Gun? You've just finished covering your home with a quality wood siding. It looks great, and now it needs to be protected. Penetrating oil-based stain can be applied with a brush, roller, or sprayer. Using a sprayer is the fastest way to apply stain to siding. However, spraying stain requires specific conditions and provides unique challenges. There are a few tips and tricks that can help you to achieve an attractive and lasting finish for your wood siding. Make sure you have the right conditions for spraying. It should be done on a relatively moderate, dry, wind-free day. Temperatures over 90 degrees Fahrenheit can cause the stain to dry too quickly and form a tacky coating on the surface of the wood. Moisture can also prevent stain from penetrating. Wind will cause your spray to blow all over the place. If you aren't careful you can end up staining your neighbor's' house along with yours. Mask off anything you don't want stained. Use masking tape and sheet plastic to cover windows, doors, and fixtures. Get the right sized tip for the job. You will want to spray along the length of each siding board. Pick a tip that will create a spray pattern as wide as one or two boards. Tips are numbered. A "411" tip, for example, creates a spray pattern of 8 inches when the tip is held one foot away from the siding surface. A "611" tip creates a spray pattern 12 inches wide when held one foot away. Adjust the pressure on the sprayer. Lower pressure, between 800 and 1000 psi, will provide you with good control. By cranking up the pressure you run the risk of over-spray. Apply a generous amount of stain and work it in with a brush. It is helpful to have a partner who can follow behind you as you spray and use a paint brush to work the stain in and remove the excess product. Most oil-based stains cover with one coat. Applying too much stain can leave you with a sticky surface that will attract contaminants. Spraying creates very fine particles of stain that spread easily. It is important to wear a NIOSH-approved mask, protective clothing, and eye goggles. 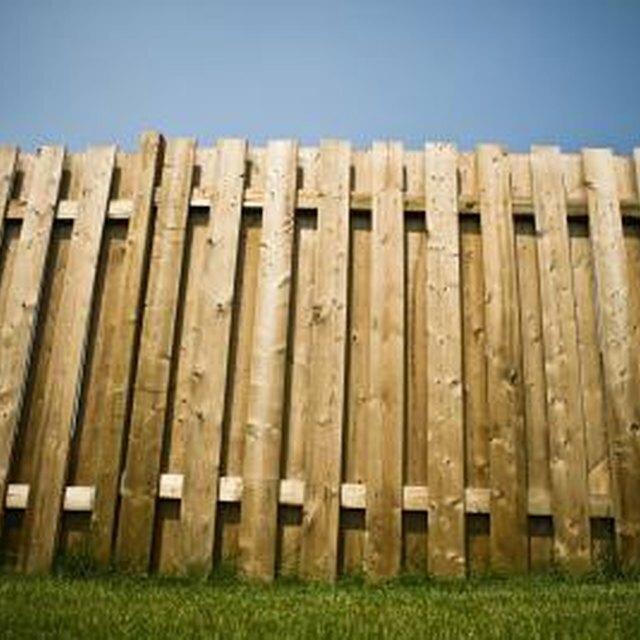 Should a Fence Be Power Washed Before Staining? Can I Powerwash Wood Siding?